The Psychology Department has a strong commitment to training students to work with deaf and mute populations and to research that assists with the development of new techniques and tools to support members of the deaf community. 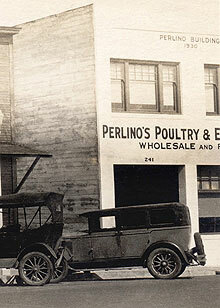 Perlino's Poultry & Egg Store, circa 1930's. The Federico and Rena Perlino Fund supports scholarships and fellowships in the Psychology Department. The annual awards are based on merit and are open to both undergraduate and graduate students whose research focuses on issues related to deafness or the development of new techniques and tools to support members of the deaf community. Federico Perlino died in 1981, and Rena Perlino died on October 20, 2003. Together, they had owned and operated Perlino's Poultry Market on Front Street in Santa Cruz, the current site of the Santa Cruz Community Bank, from 1930 to 1960. The Perlinos bequeathed their estate to be used to benefit the local community, and the UC Santa Cruz Psychology Department is one of several local beneficiaries. John R. Biondi, the Perlinos' friend and financial consultant, was their estate's executor. The Psychology Department has a strong commitment to training students to work with deaf and mute populations and to research that assists with the development of new techniques and tools to support members of the deaf community. The department offers an undergraduate seminar course titled "Deafness and Sign Language" that explores many of the cognitive, perceptual, and linguistic issues raised by hearing loss and the use of language in the visual modality. For more information about this award, please contact the Psychology Department by telephone (831) 459-4416 or visit the department's website.